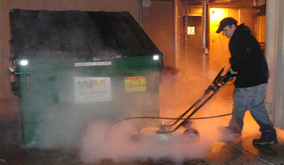 Our residential and commercial pressure washing and steam cleaning company services the entire Phoenix metro area. Call us today for a free driveway cleaning quote! We are Phoenix Arizona's premier driveway cleaning, driveway restoration, driveway sealing, and residential pressure washing company. AZ PowerWash Pros holds a $2 Million dollar general liability insurance policy. 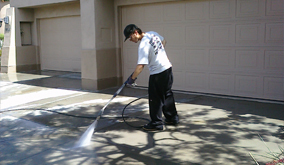 We are Phoenix, Arizona's first choice for pressure washing and residential driveway cleaning services. We are an environmentally friendly and EPA compliant pressure washing service that offers waste water recovery services for an affordable price to both residential and commercial customers. Our driveway cleaning service can successfully remove rust, oil, and tire marks from any driveway in Phoenix. We use steaming hot water and high pressure to blast away all dirt and debris from your Phoenix driveway. Call us today for a free driveway cleaning quote! "Just Call The Pros"
Does your driveway get dirty fast? If so, you are probably in need of a driveway cleaning and sealing service from AZ Power Wash Pros! Not only do we use 3500 PSI and 240 degree steam to clean your driveway, we also offer glossy and flat driveway sealing services. Sealing a driveway is a great way to protect the life of your driveway and keep it clean all year long. We offer disounts on driveway sealing services for customers who have our company clean their driveway first. A sealant will make it easier to clean your driveway and protect it from stains and damage to prolong the life of your concrete or paver driveway. Call us today for a free driveway cleaning and sealing quote! We offer residential driveway cleaning to all of Phoenix, AZ. There is no driveway to small or large. 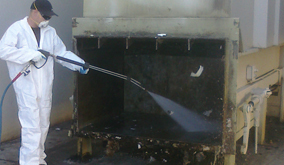 We are Phoenix, AZ's industrial power washing service. We clean up after construction companies. We are Phoenix, Arizona's premier residential exterior pressure washing service. Call today!